Contact your State Senator and State Representative now. Tell them you support the Assisted Suicide Ban Act HB96 (Rep. Mack Butler) and its companion bill SB198 (Sen. Phil Williams). House Information: (334) 242-7600 – Senate Information: (334) 242-7800, to voice your concerns with your legislators NOW! Ask them to pass this legislation to insure that Alabama protects life until natural death. Alabama must not join the five states plus the District of Columbia who have already legalized assisted suicide and the other 21 states that are currently considering legislation to legalize “assisted suicide” which redefines the concept of medical good as never before. Our state has long supported its commitment to protect and preserve all human life at every stage. As this legislation states, the state has an interest in protecting vulnerable groups, such as the impoverished, the elderly, and disabled persons from abuse, neglect, and mistakes. The state also has an interest in protecting the integrity and ethics of the medical profession. Assisted suicide laws clearly violate fundamental medical ethics. Without protections from assisted suicide in Alabama, the elderly, individuals with special needs, and the mentally ill will become targeted for assisted suicide as they have in other states. Alabama is one of the few states that currently has no statute directly addressing assisted suicide. The U. S. Supreme Court has upheld state bans on assisted suicide, and it is time for the Alabama Legislature to take action by passing the Assisted Suicide Ban Act. In states that have legalized physician assisted suicide (PAS) there are few protections for those with mental health problems. Even in Oregon and California, where the law calls for counseling where the physician thinks the patient may have psychiatric or psychological disorder or depression, less than 4% of those who received a prescription were referred to counseling. Inadequate pain control was identified as a concern in only 1/4 to1/3 of the cases. If the reason for the decision is not physical, it is safe to assume that more patients should have received professional counseling other than from their physician. With such laws, there is nobody to hold the physician accountable. The laws allow too much latitude for physicians to rely on their own opinions in their practices. PHYSICIANS NEED TO HELP SUCH DISTURBED PATIENTS, NOT KILL THEM. The legislature has returned for another session and some GOP legislators are once again pushing a longitudinal data collection scheme. Once again the primary opponents of this grand scheme are fellow Republicans. On Thursday, February 23 Alabama Eagle Forum led a conservative rally in opposition to the longitudinal data bills, House Bill 97 and Senate Bill 153. State Auditor Jim Zeigler (R) read a statement from his wife, state school board member Jackie Zeigler (R) vowing to oppose the data collection. A statement was read from Representative Barry Moore (R from Enterprise). Moore said that only communist countries think they can direct children into career paths from early childhood. Moore questioned education rankings where countries that have invented nothing and innovated nothing are ranked higher than the U.S.
Rep. Arnold Mooney (R from Indian Springs) said that liberty loving people must be most on guard when the government acts with good intentions. Glover has recently announced his 2018 candidacy for Lieutenant Governor. Current Lt. Gov. Kay Ivey is term limited from running again. State School Board member Stephanie Bell (R) warned of a potential for government tyranny with this. At this point the best place for HB97 and SB153 is the trash can. Bell said that the federal government has demonstrated in the last year how vulnerable their data bases are to hacking. They can not secure the data. “This is about growing bureaucracy.” This will become one of the biggest budget items in state government in future. Joe Godfrey ALCAP quoted GK Chesterton: “It is only in believing in God that we can ever criticize government, because without God they will worship government as God.” Godfrey warned of the dangers of giving the state of Alabama that much power. We need to encourage our legislators to stand strong in opposition to this. Rep. Allen Farley (R from McCalla) said, “I am a Christian conservative member of the Republican Party in that order.” Farley said, “The poor schools are in the poor communities. Most of the prison population comes from the poor communities.” “As a Republican we believe in smaller government but a big and great God. Farley warned about the danger of data collection. State School Board member Betty Peters (R) said, “I have no faith that no harm will be done.” “We have new things coming at our children every day that invade our children’s privacy.” “We must assure that no harm is done,” to the children of the state. This database is being run by a board with very few elected people on it. At the state Board of Education we asked questions. Then Governor ordered the board set up through an executive order with all of these appointed people, many of them appointed by him. I do not like appointed boards where everybody is appointed. I am elected if you don’t like what I am doing you can vote me out. Appointed people only answer to the person who appointed them. Rep. Mike Holmes (R from Wetumpka) said that the HIPAA data was also supposed to be secure. The dirty little secret is those HIPAA laws are not being enforced. There are 1300 complaints against the people running the database and the same people who maintain that data base are the people who is running this data base. Data mining of the database has become big business. if they can do that with the medical database they can do that with this. What with manipulation of currency and theft of jobs, China is held in fairly low repute, especially down South. But some Alabama legislators seem enamored of at least one part of the Chinese system – the one that compiles enormous amounts of data on citizens, beginning when they’re toddlers and continuing through their careers, and swaps this data back and forth among various government agencies for government purposes. One might expect this kind of dangerous nonsense from, say, California, but . . . Alabama? Parents and citizens are alarmed at two companion bills (SB 153 and HB 97) currently moving through the legislature to create a massive centralized warehouse of education and workforce data. This system would be called ANSWERS, or the Alabama Network of Statewide Workforce and Education-Related Statistics, which would be administered by a new Department of Labor bureaucracy called the Office of Education and Workforce Statistics (the “Office”). The reach of ANSWERS would be sweeping. Operated by the Office, the system would combine education data (beginning in pre-K) and workforce data to provide information on the effectiveness of educational and workforce-training programs, and to assess “the availability of a skilled workforce to address current and future demands of business and industry.” (The bills don’t explain how the government can predict the “future demands of business and industry”; the Soviet Union tried it, but without much success.) The data could then be analyzed for whatever purposes the bureaucrats come up with, and used for “research” which, if history is any guide, will be ignored if it doesn’t support what the bureaucrats want to do. How would this work? An Advisory Board would be established to identify the types of data that certain listed governmental entities would have to dump into the centralized warehouse. The statutory (and non-exclusive) list of such data sources includes all education agencies in the state, from pre-school through four-year universities – plus the Departments of Labor, Commerce, and Veterans’ Affairs. So these billions of data points on practically all Alabama citizens would be centralized into one repository to be sifted and shifted by central planners. But surely the Advisory Board will be constructed so as to protect the interests of children and their parents. Not exactly. Of the 24 members, 22 must be either politicians, bureaucrats, or representatives of specific entities such as higher-education systems. One must represent private industry and know something about data-security (the bills’ only nod to security concerns), and the last shall be a lonely “representative of the public” (not necessarily a parent). The fix, ladies and gentlemen, is in. The privacy concerns with ANSWERS are staggering. For one thing, although certain proponents have suggested the data would all be de-identified, the bills clearly contemplate the presence of personally identifiable data (by requiring “security clearance . . . for individuals with access to personally identifiable data”). Indeed, the bills specify that the Office would be considered an “authorized representative” under the Family Educational Rights and Privacy Act (FERPA), and the only point of such a designation is to be entitled to receive students’ personally identifiable without parental consent or even notification. Even if all data were to be de-identified, data can be frequently re-identified – especially when there are hundreds of data points on each individual to enable data-matching. And the bills even specify that the Office is to “link educational, workforce, and workforce training data from multiple sources through quality matching.” In such a vast repository, anonymization will be difficult if not impossible. No more comforting is the bills’ requirement that the system comply with FERPA and other unspecified privacy laws. Five years ago the Obama administration gutted FERPA by regulation, thus enabling almost unlimited disclosure of personally identifiable student data as long as certain terms are used to justify the disclosure. Do the bills’ sponsors not know this? If not, what are they doing writing legislation that relies on FERPA “protections”? The bills require no particular system of data-security, leaving that up to the Office. But the Office will have an unenviable task, given that this wealth of extremely sensitive information (including student education data, Social Security numbers from the Labor Department, family income information from student-loan programs, and on and on) will be conveniently assembled into one neat package and therefore made enormously attractive to hackers. One might as well assemble all the crown jewels of Europe into one room and hope jewel thieves don’t notice. If enacted, ANSWERS would be among the most intrusive longitudinal data systems in the country – only 16 states and D.C. have such an Orwellian system. But most Alabama parents understand that the government has no right to collect highly personal data on their children, or on adults for that matter, and give it to other agencies to track their journey through the workforce and through life. It is none of the government’s business. One would have expected Alabama officials to understand this as well. An equally fundamental, and troubling, aspect of this contemplated data repository is its adoption of the statist “socialization,” workforce-development philosophy of education. Traditional education in America has been designed to develop each individual to the full extent of his talents, to expose him to the best of human thought; statist education is designed to train him to be a cog in the economic machine. Only if the State adopts the latter philosophy does it need a data repository to track citizens and see how the training is working out. Fortunately, Alabama State Superintendent Michael Sentance has a strong history in a true educational system rather than a workforce-training system. His experience as Secretary of Education in Massachusetts back when that state educated children better than any other state in the nation should prepare him to recognize the dangers of the ANSWERS network. In public statements so far, Sentance has focused on the critical problems with data security. The parents of Alabama students are counting on him to go further – to reel in the dangerous inclination of the all-powerful State to collect data on free-born citizens and use it to analyze them as though rats in a laboratory. If Sentance comes out against ANSWERS, that ill-advised scheme will probably go down. Alabama is not China. Supt. Sentance can ensure that it doesn’t become so. Justice Brandeis wrote, “the right to privacy is the right to be left alone.” Privacy is an essential aspect of a free society. Yet Representative Terri Collins is once again pushing a state longitudinal database bill in the Alabama legislature. A state longitudinal database is a centrally controlled database which collects and stores personally identifiable information on students. This centrally controlled database will track students throughout their lives and continuously consolidate personal data between multiple state agencies. While the bill has been renamed “Answers” this year it provides few. Instead it will give broad powers to what will be a newly created agency and advisory board with no accountability. Personally identifiable information could be a home address of a student or where they work. This means a government employee not involved with a child’s education on a local level will have access to a student’s geographic location on a daily basis. Data in the system will only go through a deidentification process if released to the public or researchers. This does not restrict the collection and retention of personally identifiable information within the system or among state agencies. Information is personally identifiable because anyone can use this information and then identify the student by name. Personally identifiable information can be anything that identifies you as you. Aggregate data points combined can also become personally identifiable when combined in one central lo-cation. HB97 and its companion bill SB153 will combine information from ten state agencies in a central location and can potentially combine information from “any additional public agency or entity”. The philosophical foundation of HB97/ SB153 is that central planning works, that governments have the right to monitor the movements of individuals in addition to collecting unlimited information on private citizens throughout the course of their lives. These premises violate essential liberties that must be respected in a free society and violate the proper role of government in society. Human history has provided many examples of what types of government abuses result when this type of power is given to the government. If the government has the right to track and collect personal information through-out the course of an individual’s life, then there is no truly free citizen. Only current state and Federal law are mentioned in HB97/SB153 as privacy protections; but the comprehensive Student and Parent Privacy Protection Bill was not passed in the last Alabama legislative session. In addition, the Alabama bills cite dependence on the federal Family Education Rights and Privacy Act (FERPA) which was passed in 1974. However, the Federal Department of Education gutted FERPA in December of 2011. On January 3, 2012, changes went into effect that allowed for the collection of student data by third parties. FERPA is outdated to address current privacy threats with the changes from emerging technology. Thus there is no state or federal law which protects the massive amount of student data that will be collected in this longitudinal data system. At the first senate meeting on the bill this session the sponsor claimed the purpose of the bill was “to meet the demands of industry.” This vague purpose is focused subsidization of certain business interests and increasing power of unelected state agency heads. This alliance is for the mutual benefit of these special interests, but not for students. Parents and students should know that this bill allows and requires a centrally controlled data collection system to track students through the course of their lives and to collect unlimited personal information on students and potentially other citizens. Alabamians, parents and eligible students must ask themselves how important their privacy is because it is about to be handed over to a state agency and an advisory board controlled by special interests. Students, parents and private citizens were not allowed to speak at House and Senate meetings on the bills this week even though public hearings were requested. Yet multiple government agencies were allowed to speak in support of the bills. Apparently for supporters of HB97/SB153 your child’s privacy means less than the misguided demands of big industry and bureaucrats. How Much is Your Child’s Data Worth? There are no real protections outlined in the bill. Only current state and Federal law are mentioned. Dependence is placed upon FERPA (Family Education Rights and Privacy Act), which is a federal act that was gutted in December 2011. With FERPA, data collection is now available to third parties. The comprehensive Student and Parent Privacy Protection bill could have provided significant protection, but Rep. Collins refused even to bring it before her Education Policy Committee for discussion last year. See Eagle Forum of Alabama Executive Director Deborah Love’s opinion piece on HB97 here and here. Protecting student privacy rights should come first when making public policy and legislative decisions. Please encourage your legislators to vote NO on HB97 and its companion Senate Bill, SB 153. You may reach your House member by calling 334-242-7600 and asking for their office. The Senate number is 334-242-7800. Great news! All three of the pro-life bills that Eagle Forum of Alabama is promoting were reported out of the House Health Committee on Feb. 8th, after public hearings on all of them. This bill would establish the Alabama Child Placing Agency Inclusion Act. It would prohibit the state from discriminating against child placing agencies on the basis that the provider declines to provide a child placement that conflicts with the religious beliefs of the provider. This bill would give health care providers the following: The authority to refuse to perform or to participate in health care services that violate their conscience; immunity from civil, criminal, or administrative liability for refusing to provide or participate in a health care service that violates their conscience. It would declare it unlawful for any person to discriminate against health care providers for declining to participate in a health care service that violates their conscience. The bill would also provide for injunctive relief and back pay for violation. This bill would establish the Assisted Suicide Ban Act to prohibit a person or a health care provider from providing aid in dying to another person and would provide civil and criminal penalties for violations. We are asking Representatives for a “Pro-life Day” for all three bills to come up in the House. Senate sponsors should be dropping companion bills in the next few days. Please call the numbers listed above, and thank the sponsors and Rep. April Weaver, chairperson of the Health Committee for the completion of this first step. She can be reached at (334) 242-7731. Banquet guests had the great opportunity to hear and meet special speakers Michael Reagan and Associate Justice Glenn Murdock during the reception at the banquet. Click on this link https://flic.kr/s/aHskPUhqdi to see photographs from the banquet at The Club now! 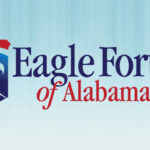 Share your photos on Facebook and tag @Eagle Forum of Alabama. 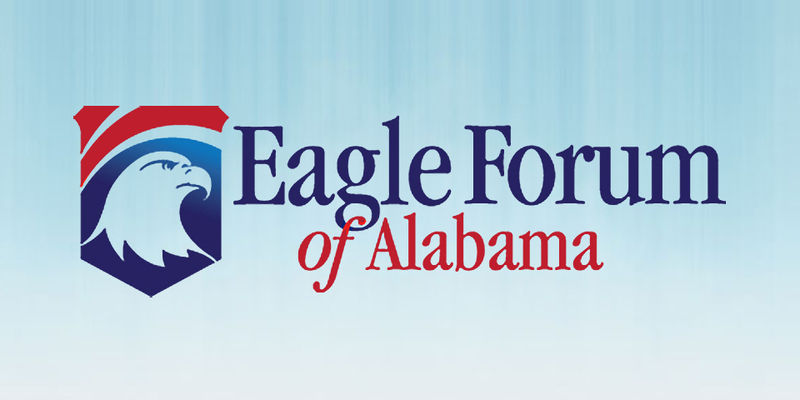 Make sure to not miss upcoming Eagle Forum of Alabama events and breaking policy updates by signing up for alerts and membership today at alabamaeagle.org. We, at Eagle Forum of Alabama, are excited to invite you to our annual banquet in Birmingham on November 14th. Our special guest will be Michael Reagan, son of President Reagan. He will speak on “Lessons My Father Taught Me” as revealed in his book by this title. Also, Alabama Supreme Court Justice Glenn Murdock will make brief remarks on religious liberty which captivated attendees at the 2016 National Day of Prayer. Eagle Forum of Alabama has worked for decades promoting conservative policies here in Alabama. In order for us to continue our vital work in these challenging times, we need your support. Below is an invitation for this event, and I would like to ask that you carefully consider supporting us by purchasing tickets ($125 each), a table for 8 ($1,000) or being a sponsor (call for more information on sponsorships). Since Eagle Forum of Alabama Education Foundation is a 501 (c)(3) organization, your support is tax-deductible except for the cost of the dinner. Please don’t hesitate to call (205-879-7096) or email ([email protected]) if you have any questions or need additional information. Please join us, and invite your friends to come, too. Today Phyllis Schlafly has gone home to be with her Lord after a long illness. America has lost a great stateswoman, and we at Eagle Forum and among the conservative movement have lost a beloved friend and mentor, who taught and inspired so many to fight the good fight in defense of American values. I have personally lost a dear friend of over forty years. Known as the “sweetheart of the silent majority,” and the matriarch of the conservative movement, Phyllis Schlafly has been a visionary, a unifier, and a voice of conscience for more than six decades. Phyllis has been credited with doing the impossible, when she and the army of grassroots volunteers she led and trained defeated the so-called Equal Rights Amendment, which had passed both houses of Congress and seemed destined for certain ratification among the states. Also previously thought impossible, Phyllis not only brought together people of various faiths that historically worked separately, she brought these people of faith into the political process like never before, creating a crucial voting block of values voters. Phyllis and her beloved “Eagles” are known for fighting tirelessly and for mobilizing political power for principle, not prestige or profit. For decades under Phyllis’ leadership, Eagle Forum has led the pro-family movement through such diverse and important battles as defending the unborn, defending traditional marriage, defending American workers from unfair trade and immigration policies, defending individual inventors from losing their intellectual property to large corporations, defending women from being drafted into military combat, defending full-time homemakers, defending conservatives and grassroots activists from establishment kingmakers, defending children from politicized public education, defending American taxpayers from out-of-control federal spending, and defending against threats to American exceptionalism. There will never be another Phyllis Schlafly. Today is a day to celebrate her amazing legacy and to remember the profound difference she made in the conduct of American public policy. Thank you, Phyllis. We will not grow weary.